students are asked to think intentionally about education, knowledge and interdisciplinarity. allows students to explore their majors in greater depth by completing upper-level electives, research, or an extended thesis. is the completion of both Interdisciplinary Honors and Departmental Honors, which allows students to experience both Honors general education & the deeper understanding of their chosen focus. Interdisciplinary Honors is available only to entering Freshmen who applied to Honors at the same time they applied to the University of Washington or to UW Freshmen who maintain a 3.3 GPA in their autumn and winter quarters and apply in spring break of their first year via our Second Year Admission process. Students who complete the 11 required Honors courses, participate in two experiential learning projects, keep an on-going portfolio, and maintain an overall 3.3 GPA will receive the designation “with Interdisciplinary Honors” on their diplomas. All Honors core courses must be decimal-graded. 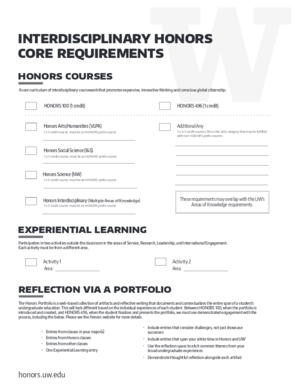 Please use the above worksheets to understand the specific requirements for two different versions of our curriculum, which differ slightly; the year references your year of entry into the Honors Program. Students who entered under the 2010 curriculum may opt-in to the 2015 curriculum by completing the 2015 Interdisciplinary Honors Opt-In form. Students who entered in 2015 or after must complete the 2015 curriculum. HONORS 100 is taken in the autumn quarter of a student’s first year in the Honors Program. In HONORS 100, students will be introduced to the Honors Program curriculum and community, and learn about resources and opportunities available through Honors and at the UW. The course is taught by Honors advisers and Peer Educators, upperclassmen in the Honors Program. Students register for HONORS 496 in their final year at UW, after taking a minimum of six Honors courses, and completing one experiential learning activity. This one-credit seminar helps students reflect on their experience at UW and in Honors via their portfolios, and culminates in presentations of the completed portfolios to the Honors community. In addition to Honors Courses, students in the Interdisciplinary Honors Program are required to identify two learning activities that are experiential in nature and extend the educational process beyond the classroom. Activities should be in the areas of leadership, research, service or international engagement. This requirement will be introduced and various options discussed in HONORS 100. To earn credit for this requirement, students must apply to have their experiential learning activities approved by the Honors Program. 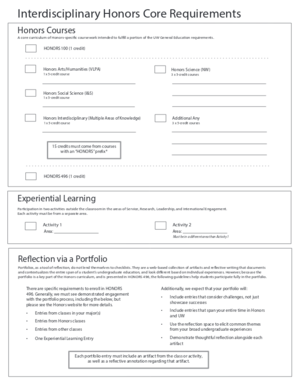 Students should also include these experiences in their portfolio, and must have completed one of the two required experiential learning activities before registering for HONORS 496. Honors students practice reflection via an online portfolio. Students are introduced to the portfolio in HONORS 100, when they are given the practical and theoretical tools to make this archive of their academic and experiential work. With the help of their Honors peers, advisers, and faculty, students continue to contribute to their portfolios throughout their time at UW and in Honors before polishing and presenting their portfolios in HONORS 496. Departmental Honors allows students to explore their majors in greater depth by completing upper-level electives, research, or an extended thesis. Departmental Honors also exposes students to a close working relationship with faculty mentors. Admission to Interdisciplinary Honors does not guarantee admission to Departmental Honors. Admission procedures are specific to each department; students should consult with an academic adviser within their department for more information. to facilitate mentorship and scholarly guidance from a faculty adviser. an extended final project or presentation (or deliverable such as a portfolio, blog, publishable piece of work, etc.). Departmental Honors can be completed in conjunction with Interdisciplinary Honors (to graduate “with College Honors in [major]”), or alone (to graduate “with Honors in [major]”). Typically, students apply for departmental admission in their junior year of college, although some majors have earlier entrance options. For admission into a Departmental Honors program or details about the process, please speak with a departmental adviser. Admission procedures are specific to each department; students should consult with an academic adviser within their department for more information. Once you have been accepted to a Departmental Honors program, your departmental adviser must activate your Departmental Honors requirements in DARS for you to be officially recognized as a Departmental Honors student. You may browse Departmental Honors options using the tool below. If you do not see the department in which you are interested, take heart – not all majors have an Honors webpage. Information about missing majors can be obtained from the departments themselves: simply email a departmental adviser to set up an appointment. College Honors, the completion of both Interdisciplinary Honors and Departmental Honors, allows students to experience both Honors general education and the deeper understanding of their chosen focus. To earn a College Honors degree, students complete both Interdisciplinary Honors and Departmental Honors in at least one of their majors. Completion of both these requirements earns a student the distinction of graduating “With College Honors in [major]”. Students must maintain a 3.3 cumulative GPA to remain active in the Honors Program and to graduate with an Interdisciplinary, Departmental or College Honors degree. Some Departmental Honors programs have higher GPA minimums; please check with your departmental adviser regarding departmental GPA requirements.